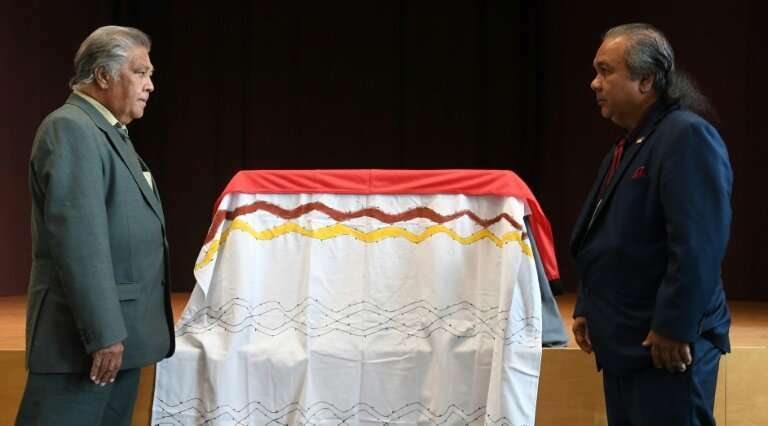 The Australian ambassador to Germany, Lynette Wood, and elder Gudju Gudju Fourmile of the Yidinji people received the skeletal remains at Munich's Five Continents museum where they have been stored since 1889. "His journey now will be to be taken back home to Yidinji country," Fourmile said. Yidinji representatives draped a black, yellow and red Aboriginal flag over the box containing the remains. Skulls and bones from Australia's native peoples were removed by scientists in the late 19th and early 20th centuries and taken to museums, universities and collections in Australia and around the world. There they were subjected to "research" purporting to explain human biological variety. In a statement, Australia's Minister for Communications and the Arts Mitch Fifield welcomed the planned repatriation of a total of 53 Australian indigenous remains from Germany in April, saying it would be "the largest number of ancestors returned from Germany to date". A further ceremony is planned at Stuttgart's Linden Museum on Friday for the repatriation of eight Aborigine remains. "These ancestors will be returned to Australia under Australian government stewardship, so they can be cared for closer to home while further work is undertaken to identify their communities of origin," Fifield said. On Monday in Berlin, 37 ancestors' remains from the Saxony state ethnographic collections as well as five ancestors from Martin Luther University will be returned to Yawuru community representatives and the Australian government. "The Government would like to thank the German state governments and the collecting institutions for their commitment to recognising the significance of repatriation for all Australians, which contributes to healing and reconciliation," Fifield said. Bavaria's arts and sciences minister Bernd Sibler, who attended Tuesday's event, said the German state was committed to a "transparent approach to collections from the colonial era", in coordination with indigenous representatives. Australia's Department of Communication and the Arts said it had supported the "unconditional" return of more than 1,500 Australian indigenous ancestral remains from overseas and private collections for more than 30 years. It said it was in talks with 35 institutions across 10 countries on the return of further remains. Berlin's Charite, one of Europe's largest university hospitals, was the first scientific institution in Germany to sign a repatriation agreement with Australia, in 2008. In April 2013 it handed over the skulls and bones of 33 Aborigines to Australian representatives to be returned for burial. Germany has until now returned 51 human remains to Australia. The native Aboriginal population, who have occupied Australia for 50,000 years, were dispossessed of their lands by the arrival of settlers two centuries ago. As the colonisers pushed into the vast interior of the island continent, they were resisted by the local population and thousands of men, women and children were killed. Germany is stepping up efforts to return human remains in its museums, hospitals and private collections. The culture and foreign ministries as well as regional and local cultural authorities signed a pledge last month to speed up the return of human remains and artwork from former African colonies. Germany has on several occasions repatriated human remains to Namibia, where it slaughtered tens of thousands of indigenous Herero and Nama people between 1904 and 1908.